Get your mind and energy aligned with the flow of Life and shift to a higher level of living. 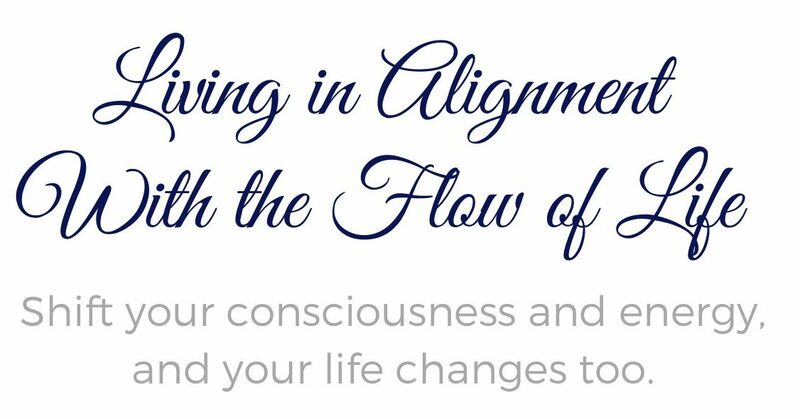 You’re already flowing with a current, but it might not be the flow of your own life’s energy, or you might be slightly off it and simply need to get realigned to get back on track with yourself again. If you feel stuck, lost, held back, or are experiencing lack or limitations in your life, it’s because of where you are in consciousness and the energy frequency you operate on. And if you’re not doing what you really want to do with your life or are somehow struggling or not seeing the results you want to see, it’s also because of where you’re at in your consciousness and energy. Consciousness is both the problem in life, and it’s also the solution to everything. Once you get your mind and energy in alignment with the flow of Life, you can’t but love life. Your inner being is limitless and when you awaken to it and understand how to use your mind and energy the right way, amazing things will start to unfold and happen for you. Getting your mind and energy aligned with the driving force behind your life enables you to have a full, rich and fulfilling experience of life. I’ve worked with energy for over 15 years and know that there are no limits to what it can be used for and directed towards. Since energy knows no time or space, I’m able to channel life force energy to you wherever you are in the world. I’m able to alter people’s energy and raise their vibration and I see over and over again how energy work can create incredible results in people’s lives that you might even want to call magical or miraculous. It’s a process that clears, unblocks and removes anything that is not in alignment with the Truth of who you are and elevates and empowers you on a core level of being and brings forth your innate powers to the forefront of your life. Life has an amazing way of opening up in incredible ways when the flow is unblocked and the person gets into alignment! Energy work realigns your mind and energy and gives you enhanced awareness, intuition, focus and mental clarity as well as emotional peace, confidence and personal power. In the treatment I clear your energy and set the mind and energy in motion on your behalf on the things we’ve talked about and specified in our session together. Energy work can be done for different things each time according to your current needs and desires. It’s an effective method and process that can literally create miracles in your life. I’m intuitive and tuned into and aware of other people’s energy and consciousness so I see things that others are not aware of and have the ability to cut to the heart of the matter quickly. I can see your mental barriers, blockages and blind-spots and are able to identify exactly what needs to shift or what’s keeping you stuck or blocked. Even though I am a certified Life Coach I don’t follow any particular school or modality of coaching and I don’t have a script or specific plan or procedure for my sessions. I have developed my own way of coaching over the years where I use my intuition and my understanding about the human condition and the nature of the Universe, so I meet people where they currently are and help them break through to a new and higher level of consciousness and energy vibration. Every session is uniquely dynamic and no two sessions are ever the same as each person is unique and have their own individual reasons for working with me. Sessions are via Skype or ZOOM Video Conferencing. One single session can create life-changing results for you as you have inner shifts and your energy is altered and the flow is opened up. The energy treatment is conducted offline, directly after we’ve ended our conversation. I channel and do the energy work in a meditative state while you lay down somewhere where you can relax and be undisturbed and receive the energy. You’ll have breakthroughs and transformations that will impact all areas of your life, and because of the transformative nature of this work, the impact will continue to unfold over the weeks and months to come. A follow-up email is included as well where I share any intuitive messages that might have come to me in the energy treatment, notes, next steps etc. that can be helpful to as you move forward on your path. Private meeting in Costa del Sol, Spain: 300 Euro. Come and see me here in Spain for a one-on-one talk and a hands-on energy treatment. We’ll meet for 2 – 2 ½ hours and look at any aspects of your life that are important to you and where you’d like to go from here. You’ll leave the session feeling empowered with new fresh insight, a renewed sense of aliveness and zest, and above all, feeling deeply connected to yourself and aligned with the flow of Life. Home visits in Costa del Sol possible too (Malaga – Marbella area). A transformational month with me: $2000. This is an ALL IN option that is available by application only. Energy treatments after sessions to raise your vibration and set the things we’ve talked about in motion for you. Unlimited priority email access to me whenever you want to ask or share something with me. Access to me via WhatsApp; You can text me or send a voice message to me at any time throughout our time together. Receive ongoing feedback, suggestions and encouragement from me as you move forward on your path. We’ll be working very closely together and I’ll be there to guide and support you throughout the whole month. Having someone that is fully on your side supporting and helping you is incredibly powerful and the fastest way to create transformations and shifts in your life. By having me by your side you’re never left frustrated or stuck and you’ll be able to progress faster than you ever thought was possible. This option is for you if you want to reset your life, your mind and energy, and create something new, and you want it Now. You also get unlimited priority email access to me for an additional two weeks after our last session to further support you on your path. I only work closely with a few clients at any given moment so that I can give my very best to each person so please click on the button below and share a little bit about yourself. If I feel we’re a good match we’ll then have a short chat to say hello to ensure that this is the right place for us to start working together. *My fees will increase at the end of May, 2019. People who work with me are people who recognize the value, trust their gut, and jump right in, so if you’re not in a position or not willing to invest, I ask that you respect my time and only contact me if you’re truly ready to work with me. Absolute confidentiality guaranteed, and I’m happy to sign an NDA if needed for your peace of mind.